Classroom teachers are decorating their doors with incredible works of art. 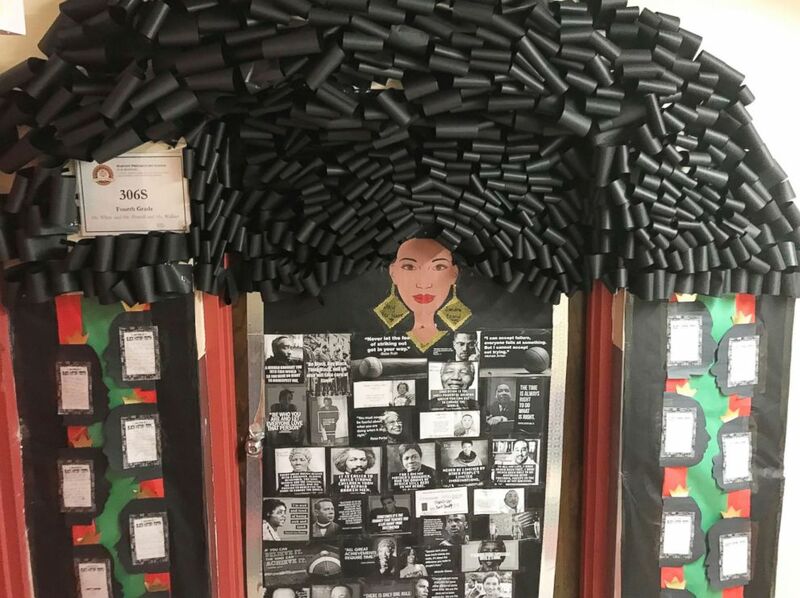 All over the country, classroom teachers are decorating their doors with incredible works of art celebrating Black History Month. We asked four teachers from different schools and grade levels to share with "Good Morning America" the stories and inspiration behind their incredible doors that are truly works of art. Chanique Davis, an art teacher for grades K-5 at Lake Alfred Elementary in Lake Alfred Florida. She is also an independent artist. 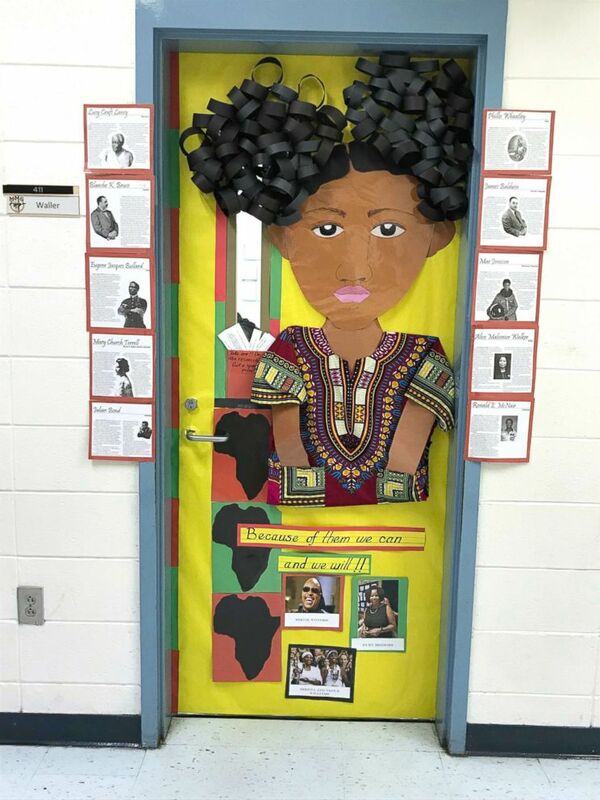 (Chanique Davis) Chanique Davis is a teacher in Lake Alfred, Florida, who decorated her classroom door for Black History Month. "I wanted to create my door with locs," Davis told "Good Morning America," using a common synonym for dreadlocks. "The reason I was inspired to do this is because locs is a hairstyle that is not welcomed in corporate spaces. I wanted to encourage our children who have locs to let them know that this style is beautiful and its hair just like any other style and should be welcomed and accepted. I wanted to teach them appreciation for the beauty of diversity even in hairstyles." 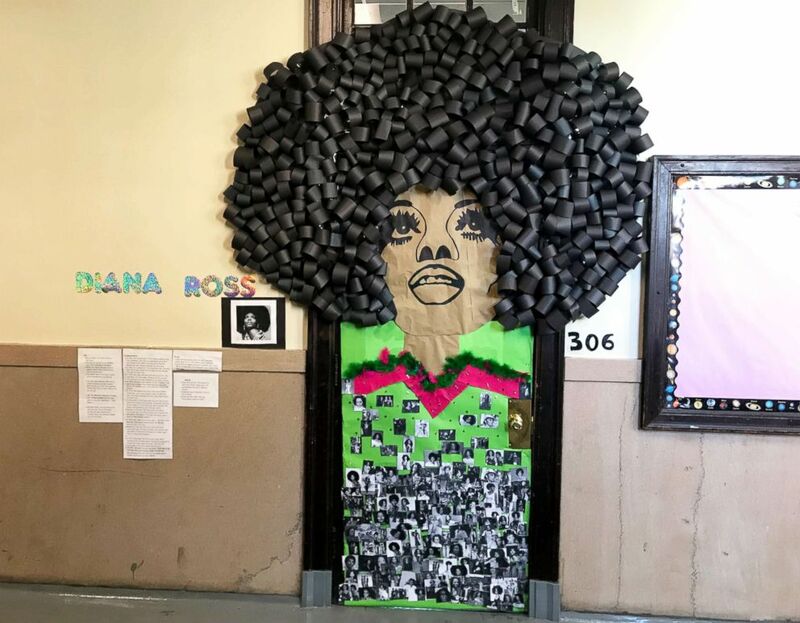 "Many of the Black History Month doors that are created have the Afro hairstyle celebrating the natural hair movement," she told "GMA". "I wanted to celebrate differently by appreciating the loc style which is still natural hair. The yarn wrapped around some of the locs is a stylistic addition that most African American girls add to the hair and the gold clips are as well. Also widely known in the black culture is "baby hair" taking the edges of the hair and combing it out. I wanted to acknowledge and appreciate these little, subtle things that are so particular to black hair and black culture." "The kids are astounded," she continued. "They are always in awe every time they walk up to the door. It's beautiful to see children of different nationalities appreciate the style of hair that the door has. I believe it's training them in tolerance and acceptance of diversity. They love it!" Marcia N. Waller is a Georgia Network For Educational and Therapeutic Support teacher for ages 11-14 at Miller Fine Arts Magnet Middle School in Macon, Ga. She is a published author, a mom and is pursuing a Masters degree in teaching. (Marcia N. Waller) Marcia N. Waller is a teacher in Macon, Ga., who decorated her classroom door for Black History Month. 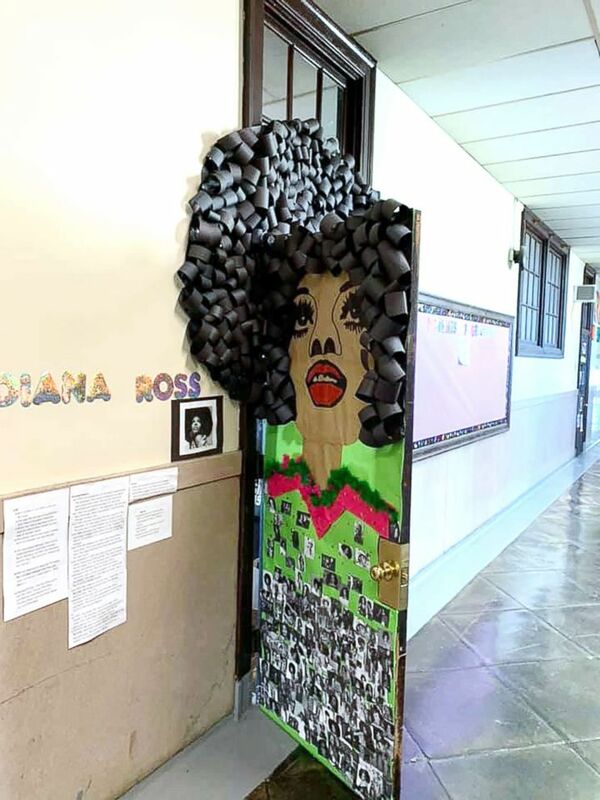 "My source of inspiration for my door was that not only is it Black History Month but my culture is so rich with the accomplishments of African Americans past and present," she told "GMA". "I want my students to always know that they can do anything they set their minds to and accomplish great things as well. I don't like to say that the sky is the limit because when you reach the sky you'll stop. It's what's beyond the sky that I want them to strive for." "We all are a part of history. I also want them to know that Black History happens every day and not just in February, so my door is going to stay up all year long. Oh and it looks pretty cool too! The students throughout the school were so blown away by the 3D, Afro puffs and the Dashiki." Anecia White teaches at Harvest Preparatory School located in North Minneapolis, MN. I teach 4th grade and have a class size of 25 of which every student is African American. (Anecia White) Anecia White is a teacher in North Minneapolis, Minn., who decorated her classroom door for Black History Month. "I attended Harvest Prep as a child and it has been my honor to be able to give back to the community [which] has given me so much," she told "GMA". "My source of inspiration for the door was every student in my classroom. They inspire me to be a better teacher every day, and I hope to inspire them to continue to learn about themselves." "I try to instill in my students that black history should never be narrowed down to just one month within the year, but we should celebrate black history year round. That is why I began decorating my door before Black History Month, and I plan to keep the door up well after this month is over." "Because Harvest Prep has given so much to my class and I, we wanted to give back a little thanks. Each child made a silhouette of their face, and on the inside has a description of why they LOVE being black, and why they LOVE Harvest Prep. Also, Harvest Prep is centered around the principals of Kwanzaa and our class had the principal of “Kuumba” (Creativity). As a class we decided decorating our door would be the best way to show our creativity. We had all hands on deck to get the job done, exemplifying our “Umoja” (Unity) as we worked." Patrice Bertotto teaches English Language Arts to 7th and 8th grade at James R. Ludlow Elementary School in the School District of Philadelphia. She has been a teacher for 21 years. 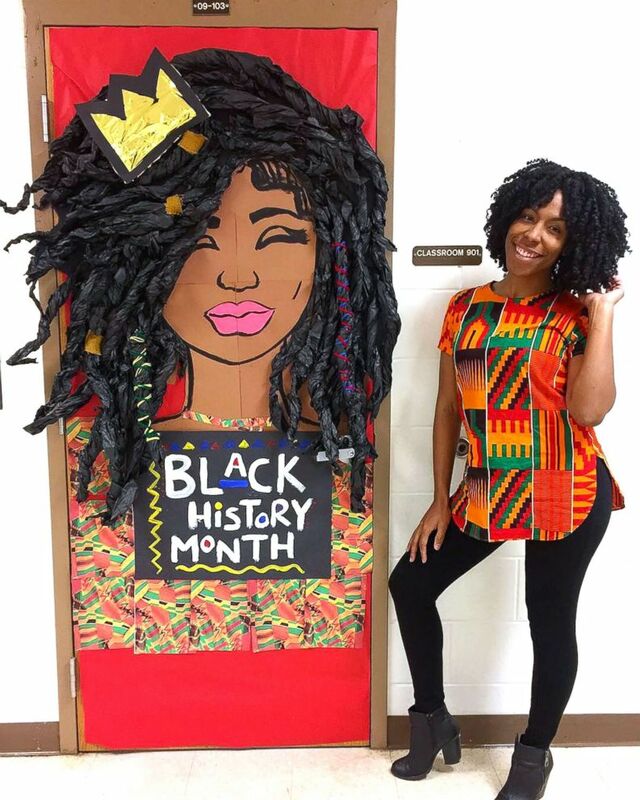 (Patrice Bertotto) Patrice Bertotto is a teacher in Philadelphia who has decorated her classroom door for Black History Month. "I don't have a homeroom, so I asked my grade partner if I could decorate his door with the 8th grade during my ELA period and I worked on my door with 7th grade during their period with me," she said, referring to English language arts by it's common acronym. "We do have a Black History Month door decorating contest in our school and we each select a person to design our door about." 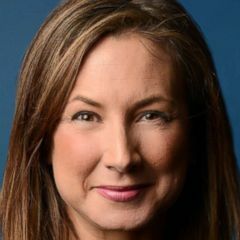 "The 8th grade class is 17 students, so when I first presented the idea to them, I told them the jobs we needed to get it completed and they went from there," she said. "I wanted to highlight their talents. Two girls worked on the face. Three girls focused putting the hair up on the door, while there was an assembly line of cutting and stapling the paper loops." "One girl focused on the dress," Bertotto continued. "Many printed and cut out all of those pictures. Others did research about Diana's life and career. I maybe touched the door two or three times during the process where I needed to help here or there with taping something down, attaching something high. This was all them. I did select the picture of Diana that I wanted to depict, but other than that...it's their design." "Aside from the actual design, Diana Ross is so inspirational," she said. "She is a pioneer. In my opinion, she's not often recognized for her contributions in creating a greater acceptance of American black culture during the time of the civil rights movement. Her music is incredible and I knew that my students would connect with her. They all recognized a ton of her music once we started playing it and they decided that 'I'm Coming Out' is the greatest line dance song of all time." "[The kids] are really proud because they put so much hard work and effort into it. They mentioned that it was really frustrating at times and really had to trust each other. It took them about 3 days to finish it -- approximately 6-7 hours. Many hands. I'm so proud of them."